* Three of my four kids are currently naked. * Two of them never got dressed today. * The other one wore a pair of lime green shorts and a yellow and navy Elmo t-shirt. * There's dried grass all over the family room floor (tracked in by aforementioned children after they were done running in the sprinkler). * Maren is no longer afraid of the sprinkler. * The kids had chicken nuggets for dinner tonight. Just chicken nuggets. Yesterday we had lunch at Wendy's and pizza for dinner. * I've read three books this week. Annie has read about eight. * My skin smells like the sun. * That huge basket of Schwan's ice cream novelties in my freezer? More than half gone. * I've decided my hair doesn't really need to be highlighted before we leave for Utah. Even though it does. * I'm pretty sure I've made up for all of the computer time I missed while we were up North. It feels good to be caught up! Want to know the worst thing about running a fall marathon? It's not that here in Texas I have to finish my outdoor runs before sunrise so I don't melt, or even that I can't toss the kids in the jogger when I want to go for a run (since there are two too many in the summer). The main problem is related to my last post-- I'm just gone too dang much to train for anything well. When we were on our extended trip up north, it wasn't hard to get the runs in because it was beautifully cool in Minnesota, but any kind of speedwork or cross-training was practically impossible. Next week we leave for Utah, and how the heck am I going to get in great speedwork when we're staying up in a canyon. I was supposed to do 20 miles next Saturday (the dang FIRST program and its 5 20-milers) so I did it this morning. 12 miles outside between 5 and 6:30, followed by 8 more miles on the treadmill from 7 until 8. Not exactly consecutive running, but close enough, right? Now I just have to figure out how to fit in 18 miles next Saturday when we're in Utah (because 18 is so much easier than 20, right?). Vacation-- good for the soul, but not good for training. Can someone teach me some balance, please? Last summer, you may remember that I whined and whined about how we were having the longest, most boring summer ever. The state legislature had decided to change the school calendar, pushing back the start date of school by half a month, which meant that instead of a typical 12 week summer, the summer of 2007 was almost 15 weeks. Our presence was also requested at two big family events just before school got out (my sister's wedding) and just after it started again (my grandparents' 60th anniversary), so we didn't have a lot of leftover money to go gallivanting around the country. Furthermore, my parents were moving and Eddie's parents were remodeling their house, so we couldn't go hang out at their houses to escape the Texas heat. So we hung around in the house a lot. Watched too much tv. Meandered over to the splash park from time to time. Had our Friday Fun Days. Spent mornings taking swimming lessons at the YMCA. Sometimes the days seemed very, very long and I was thrilled to pack the kids back off to school in the fall. This summer, I didn't want to be bored. School got out the first week in June. The next week, the older kids went to camp, Isaac had swimming lessons, and our house filled up for Bryce's baptism. The next weekend I ran the Wasatch Back. I was home for just long enough to wash some clothes and repack the suitcase and we left for our big trip up north. My mom (my co-conspirator on the journey) flew home this morning. We've either had guests or been guests every day since June 11th. It's July 15th. We leave for Utah a week from tomorrow. When the pendulum swings, she really swings. I've been trying (in vain, I feel) to catch up on everything I missed in cyberspace over the last month. One of the things I came across was Brooke's beautiful post about the dog days of summer at Segullah. It made me feel like, in my attempt to stave off boredom, I'm missing out on one of the essential parts of summer. So, in typical Shelah fashion, I'm going to try to cram in a few weeks of dog days into the otherwise hectic pace of our summer. We were supposed to meet some friends at their beach house this morning. It would have been really fun, but Maren has a cold, and I'm secretly relieved. After spending weeks in the car, I wasn't really looking forward to three more hours today, followed by hypervigilant sunblocking and eagle-eyed policing of four kids in a large body of water. In fact, I'm not going to do anything today. I'm ignoring the fungus that seems to have erupted in my toilet while I was gone, the baskets of folded laundry waiting to be put away (thanks, Mom! ), the piano which needs to be practiced, and the typing and French cd-roms which I stupidly thought the kids would be eager to tackle this summer. Today, I'm going to take a cool shower, not dry my hair, and read all of the magazines that came while I was out of town. I might make slurpees. The kids can watch as much tv as they want. Tomorrow, we might come back to reality, but if not, that's ok. Remember how I blogged a few weeks ago about the comparison between running a relay like the Wasatch Back and running a marathon? I came to the conclusion that the relay was harder because even though you got breaks, it lasted longer and was therefore more tiring. After this trip to Minnesota (we got back really, really early on Thursday morning and I'm just now in the proper mental state to spend some time at my computer), I'm wondering if I might have been wrong in my original assessment. The drive up to Minnesota was sort of like running a relay. We got in the car on Wednesday morning (a little more than two weeks ago) and had a pretty long day in the car that day. But we got out several times for meals and bathroom breaks (although I must admit that the little urinal we used when Isaac was in the spica cast is very, very handy for long car trips with toddlers). We pulled into Miner, Missouri (yep) and it's neighboring town of Sikeston for an early dinner at Lambert's Throwed Rolls, a place we've passed many times but never stopped. We arrived at our hotel in Cape Girardeau in time to swim in the pool, watch tv, and explore every square inch of the lobby while we tried to get the littlest kids to bed. The next day, we knew we had about seven more hours in the car to get to Chicago, so we got up early, drove to St. Louis, split up (girls to the arch and the art museum, boys to the zoo), then met up and drove to DeKalb, where my sister lives. Then we took a break for a few days, went into Chicago and hung out in DeKalb before embarking on the next leg of our journey-- the five-hour drive to Minneapolis (and yes, another zoo). The next day we drove five more hours (with yet another zoo trip) to Marshall, where we pretty much stayed put for a little bit more than a week. So it took us six days to get from Houston to Marshall, with only one long driving day, three short driving days, and a lot of stops along the way. On the way home, we took the marathon approach. We left the house in Minnesota at 4:30am, planning to drive about 15 hours, to Denton, Texas. When we got to the Kansas/Oklahoma border, we decided we were still feeling strong, so we canceled our hotel reservation and just kept driving. Just like the marathon, we did hit the wall about 2/3 of the way through (terrible traffic and thunderstorms near Oklahoma City), but we pulled into our driveway at 12:30am, only 20 hours after getting in the car. So which way should be the preferred mode of travel? I'm not sure. The first week seemed really long sometimes, but it was also really fun. The last day, although painful, was just one day. Ted Drewes-- Bryce even ate his this year without complaining! Culvers. Oh how I missed my Turtle Sundaes! Finally pulling into that driveway! Cleaning the car once we got home! Knowing that we won't be able to go back to Minnesota very soon! When Murder Detective Rob Ryan was twelve, he and his two best friends disappeared into the woods outside of Dublin, and his friends were never seen again. Now he must solve the murder of another twelve-year-old girl who goes missing in the same woods. When I start reading a novel, I usually assume that I'm going to like the narrator. With In the Woods, I started out liking Rob Ryan quite a bit. He was good-looking, smart, funny, and except for not remembering much of what happened in the first twelve years of his life, fairly normal. He and his partner, Cassie Maddox, have an unbelievably close platonic relationship. The he gets this case and starts to crack up. Over the course of the novel, I went from really liking him, to really disliking him. At the end of the book, he dates a woman who encourages him to date younger women because they might not be able to realize how screwed up he is. It was interesting to watch Ryan's life go from pretty good to pretty miserable. The book is very well-written and interesting and the characterization of Rob, Cassie and the supporting characters is excellent. In Beezus and Ramona, nine-year-old Beatrice Quimby is terrorized by the most annoying preschooler of all time, her little sister Ramona. In Ramona and her Father, Ramona (now in second grade) is terrorized by father, who lies around the house smoking cigarettes after losing his job. After too many days in the car, I was running out of things to keep the kids occupied. One afternoon, while we were wandering the busy streets of downtown Marshall (yes, that's sarcasm) we stopped in at the library and found these two books on CD. We popped them in the CD player on Wednesday morning, a couple of hours into the drive. I was pretty excited for the change of pace, and Stockard Channing, who I've loved in other things, was narrating. Listening to Beezus and Ramona and Ramona and her Father was probably the most annoying four hours of the car trip. Instead of listening to my own children, who I love, fight with each other, I got to hear whiny, screechy-voiced Ramona whine, sullen, put-upon Beezus whine, and both of their parents whine. It felt like watching Supernanny. I get enough whining in my own life (especially on cross-country car trips) I don't need to listen to other people whining too. I try not to include the cookbooks I read in the 50-book challenge, but this book deserves it. It's a book chock-full of decadent desserts, and I spent days poring over it while I was at my mom's house in Minnesota. Lots of people think they have a sweet tooth, then go on to say that their favorite dessert is something like Strawberry Pie (which has way too much healthy stuff in it to qualify as a decadent dessert) or cheesecake (which in its vanilla form is way too blah for serious dessert lovers). This morning in Gospel Doctrine, the teacher talked about how she had a craving for the Klondike bars in her freezer, but decided she was too lazy to make the effort to go downstairs to get one. Believe me, if there's something that contains both ice cream and chocolate in my household, only extreme willpower will keep me from it. I'm the girl who always adds a cup of chocolate chips to a brownie mix and isn't happy when there's no hot fudge in the freezer. I've never met a dessert that was too rich. Unlike most cookbook authors, Jill O'Connor gets it. She's a kindred spirit, with my mom and little sister, who knows that you can never, ever have enough chocolate. We made a recipe from her book (for blondies, but they had a boatload of chocolate in them) and it was so good. I'm hungry for more. We all know about Anne Boleyn, the second wife of Henry the Eighth. 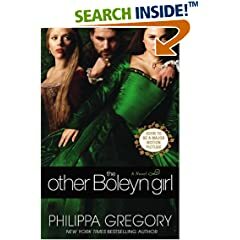 This is the story of Mary Boleyn, Anne's younger sister, whose family sent her to the king's bed when she was fourteen and who bore him two children before he started his relationship with Anne. I know, I'm surprised that I haven't read this book yet either. I've been on the waiting list at the library for, like, forever, and I also have a friend who has been trying to get me to borrow it, but I've never gotten around to making it over to her house. So when I ran out of books on the fourth day of our trip, I found myself standing in Marshall's bookstore with four kids (and my mom) waiting for me in the car and not much time to browse. I was excited to see this one on the shelf. It's a consuming book. It's more than 700 pages, but I read it in three or four days. I can't say that it's exactly a fast-reading book, or a surprising book (we all know that Anne lost her head when she failed to produce a male heir). In fact, I really wanted the book to move faster at some points (I think it should have been about 200 pages shorter). And the history, while interesting, was not nearly as interesting as the rivalry between the two sisters and the way the family used both girls (especially Mary, since Anne seemed more a willing victim) on their way up. But the whole time I was reading, I kept wondering where they thought they'd be once they got to the top and why it was so important to them to get there. There's definitely a feminist twist to the way Mary's character is presented. After Henry is done with her, she wants to stay in the country, get a little cottage, and raise her children, but because she is a woman and not allowed to earn money (although her relationship with the king gained the men in her family many financial advantages) she must remain at court, apart from her children. Writing this made me remember that I need to check wikipedia to see if Anne was really as cold and calculating as she was portrayed in the novel. I've heard the movie isn't very good, but now I want to see it just so I can say "the book was so much better." She was a Mormon mom in her thirties, trying to balance raising her family and working on her PhD. Writing an article on the funeral practices of Puritan women, she said, "Well-behaved women seldom make history" and probably didn't realize that she was making history of her own with the phrase. 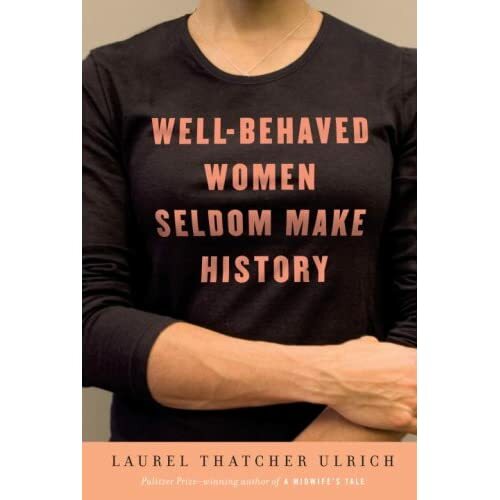 Several decades after that fateful article, Ulrich delves into the lives of women who did make history. Women who make history is a big subject. If I were advising a student who wanted to tackle it, I'd probably give him or her the age-old advice to narrow the topic, and then narrow it more and more. Ulrich, as a college professor, seemed to ignore that cardinal rule. I loved the individual chapters in the book, but the focus seemed so broad that it felt like there was a lot left out. I loved the chapter on Shakespeare's Daughters, and felt that the book was very well-written. It seemed to just skim the surface, though. I feel like it would be a good introductory book, a jumping off point, for women's studies. It made me want to buy a t-shirt or a bumper sticker. Lydia Brooke doesn't realize what she's gotten herself into when she agrees to ghostwrite the biography of Isaac Newton which her former lover's mother left unfinished after she was mysteriously murdered. 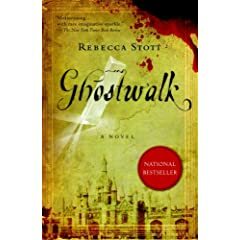 I picked up Ghostwalk in the airport, looking for something to keep myself occupied on my travels. I must have been looking quickly, because I read the sentence that said "A carefully researched vision of Cambridge circa 1665." When I sat down, I expected the book to be about Massachusetts, not England (duh-- the novel is about Isaac Newton). Anyway, this is a ghost story for those who profess not to believe in ghost stories. The characters, alive, newly-dead and long dead, all become alive. I love the perspective Brooke writes from-- one who, although still alive, knows that the ghosts will pursue her until she can no longer tell her story. 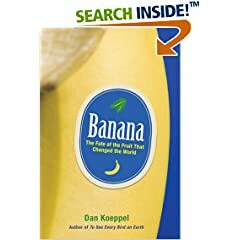 Dan Koeppel explores the history of the banana, including the dominance of the Cavendish variety (the one we eat now), the threats it faces, and the way the fruit shaped the politics of Central America for the last century. I felt a little weird carrying this book around. I read it during the weekend when I was in Utah for the Wasatch Back, and I realized at least three times that I was out in public, eating a banana, while reading this book. It was an interesting read, especially for someone like me who knew very little about the political aspect of my favorite fruit. Last year, when I read Barbara Kingsolver's Animal, Vegetable, Miracle I thought she was sort of crazy for swearing off bananas because of their political history and fossil fuel drain. Now I see that she's probably right. But like Kingsolver couldn't give up her coffee (she switched to fair-trade coffee to try to make the most socially responsible choice), I don't think I can give up bananas. They're the only thing in my diet (other than chocolate) which I eat almost every single day. Now I'll just feel guilty as I indulge.